For those unfamiliar, Shaker Village is the largest restored Shaker community in the country, dating to 1805 and active for more than a century back in its heyday. Those Shakers were some busy peeps, noted for their innovative farming methods, communal living practices and religious fervor. Touring through this collection of refurbished buildings is really interesting, and costumed interpreters are on hand for craft demonstrations, Q&A sessions and general color. Think Conner Prairie, but bigger. And with hiking/biking nature trails running throughout the beautiful rolling countryside, production gardens, overnight accommodations and a well-reputed restaurant. The grounds are crisscrossed with rustic stacked stone walls built by Scottish/Irish immigrants. Although kitted out with period furnishings and décor, my room was surprisingly up-to-date with a nice bathroom, Wi-Fi and a flatscreen TV. 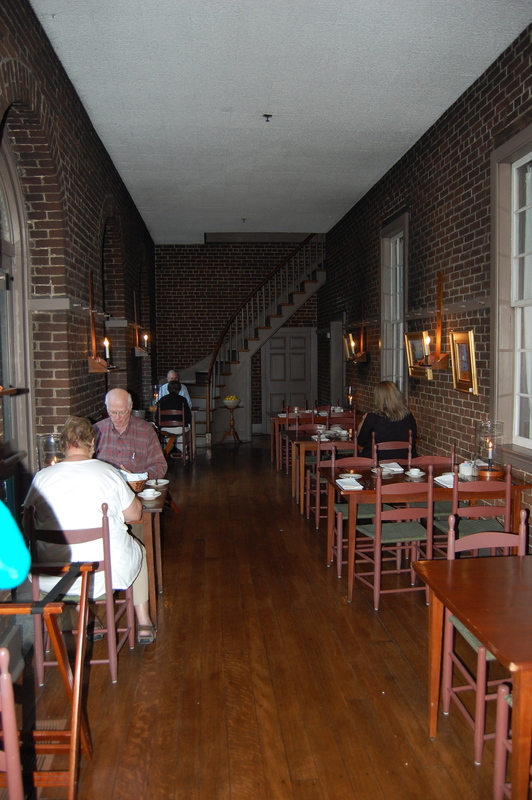 As part of my overnight I enjoyed a very pleasant dinner at the Trustee’s Office Dining Room with the Shaker Village communications manager. The vibe here is definitely rustic, as you’d expect, yet the huge hurricane candles on each table created a warm, romantic glow. For me, this was a friendly business dinner, but I could see how folks of a certain age might come here for a special occasion meal or a date night. In keeping with the theme and setting, the menu features home-cooked “seed to table” fare, and many offerings are made using ingredients straight out of the gorgeous gardens you can see from the dining room windows. 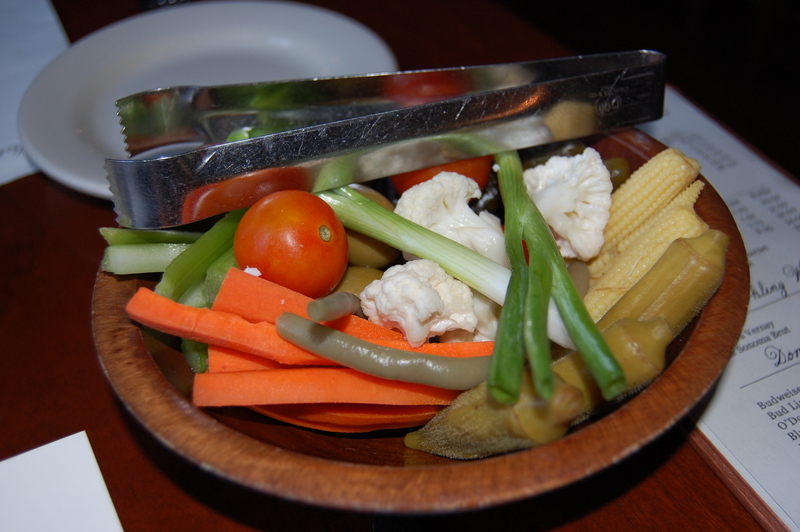 Most of the dishes feature traditional Shaker recipes, such as the tomato celery soup that’s always available. 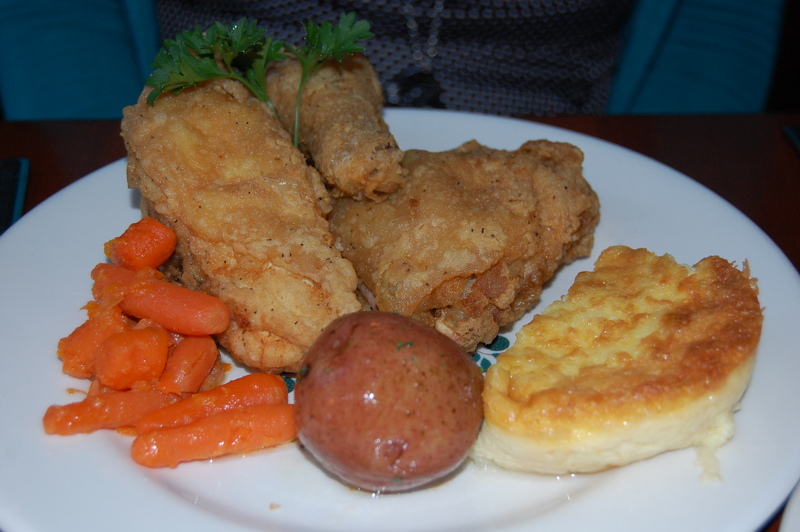 Among the half dozen or so dinner entrees ($15.95 to $22.95), you’ll find classic skillet-fried chicken, country ham steak, pot roast, fried catfish, and a quiche-like vegetable tart. Sauteed Gulf shrimp seemed the most modern option, but even it’s served on toasted croutons made with old-school salt-rising bread. All dinners are served with charming retro touches like a relish plate to get things underway; a basket filled with warm rolls and cornbread sticks; and bowls of roasted potatoes, glazed carrots and corn pudding served family-style. All good stuff, just like grandma used to make. It’s a lot of food to take in. You may want to consider skipping lunch. 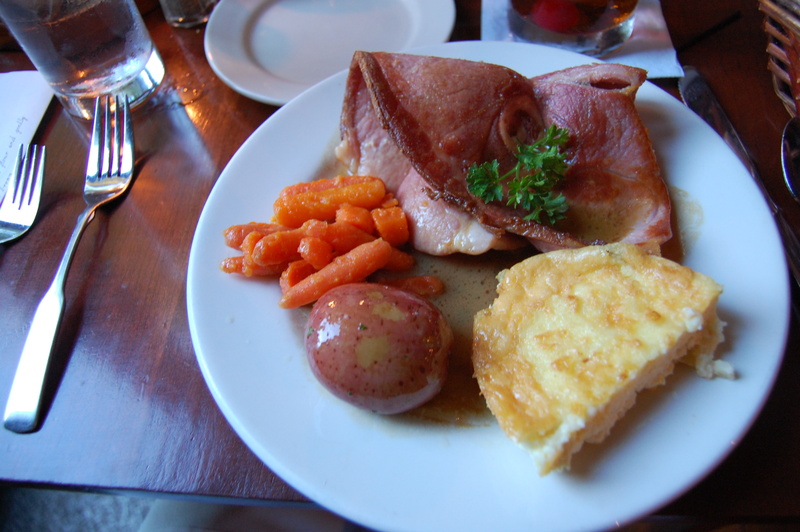 For my main, I went with the ham steak with red eye gravy. I know country ham is inherently salty by nature, but with the gravy, this was almost a little too much so. Still, the meat was tender and tasty, and the corn pudding on the side was rich and luscious. My dining companion ordered the fried chicken, a ginormous three-piece serving, and after a valiant effort, ended up taking half of it home. Don’t even think you’re getting out of here without dessert. 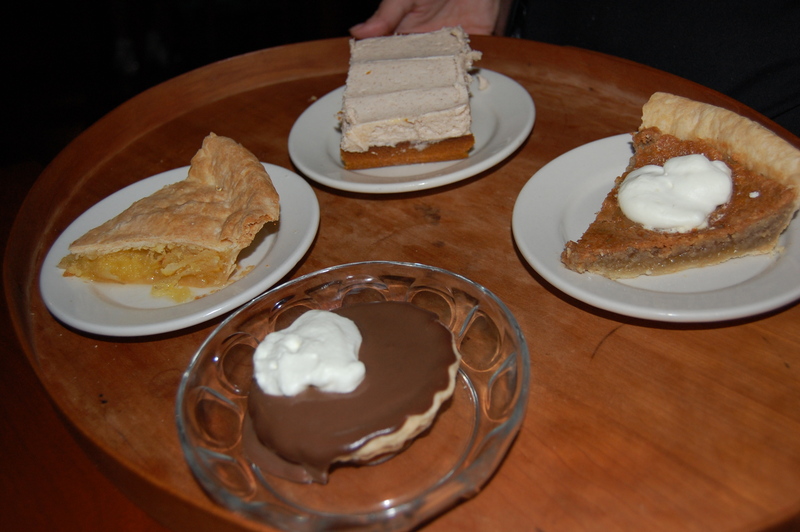 Our server brought over a tray laden with four options to tempt us — chocolate pudding, pumpkin spice cake and two kinds of pie. I know, I know… you think you’re too full and don’t have room. Get over it. I got the Shaker lemon pie, and it was unlike any other lemon pie I’ve ever had. Lest you think this is going to be some of sort of curdy, mile-high meringue, nope. 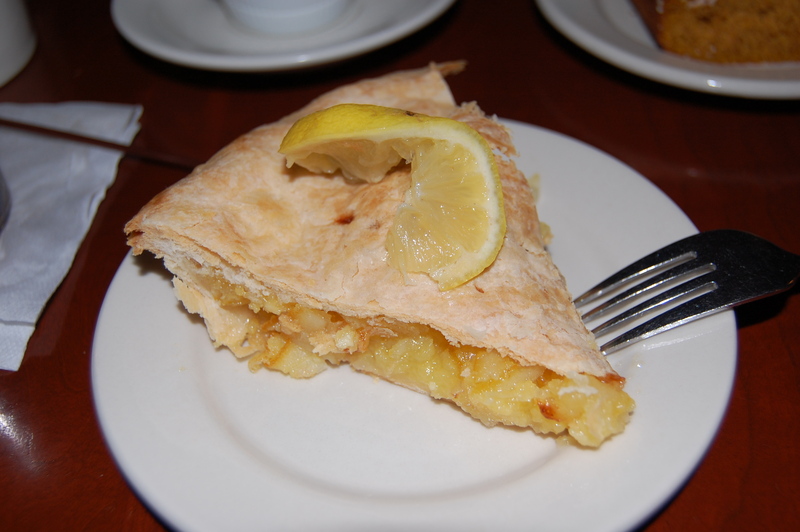 It’s a double-crust pie with a thick fruit filling made from whole lemons, peel and all. It’s not sour, but it’s not overly sweet. The server had warned me that not everyone likes it. I did. Nothing fancy, but different and unusual. My friend ordered the pumpkin spice cake, just to taste. It was good, too, a sheet cake-style slice with a light whippy topping. Like something you’d get at a church dinner or bake sale, and I mean that in the best possible way. To drink, there’s a small but nicely vetted selection of wine, beer and… bourbon. Of course. I washed things down with an expertly made Buffalo Trace Manhattan. Shaker Village isn’t trendy or fancy by any stretch of the imagination, but if you’re looking for an interesting dining experience with historic flair and delicious, accessible comfort food (lots of it), it’s worth putting this place on your radar for a road trip. The Trustee’s Office Dining Room serves breakfast, lunch and dinner. For more information, visit www.shakervillageky.org. YES!! 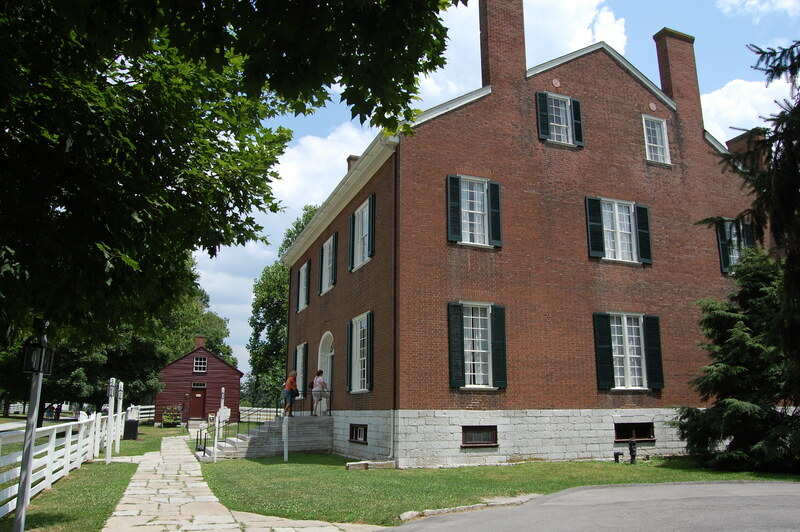 When I was in Lexington a couple weeks ago, I saw the Shaker Village sign and was intrigued. After reading your post I definitely want to check it out!